Find all the store shelving accessories you need to make your merchandise look professional and organized. 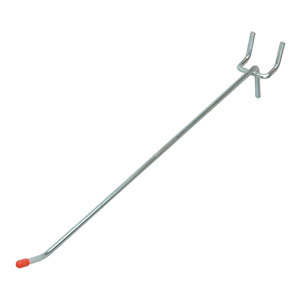 Find accessories such as sign holders, display frames for double sided displays, pegboard hooks, scanner hooks, double prong hooks, broom holder pegboard hooks, wire baskets that attach to pegboard. We also have all your slatwall accessories such as tubular face out arms in either straight or 7 ball downslant, shelf brackets to support glass shelves, light and heavy duty display hooks, and sign holders. Please call us toll-free for assistance.